This was the umpteenth time that some money case study that is presented in front to me that could be solved in a faster and easier manner. Yet, like most situation, my friend here have to live on, carrying this financial stress in his mind. It was one problem, and then another. And then another build on top of them. If you live through life this way, plagued by money problems, you will grow old fast, these mental stress will affect your work performance. My friend looks to have aged 5 years living with this spouse of his. Instead of a simple car, which already cost a lot, now he has to service an MPV, because his wife is very convinced that a normal household with kids needs an MPV. So now instead of only supporting the family on his single income, having a simple vehicle, he has a much larger loan to contend with. And he knows there are other ways round this. The problem is he is living with someone whose brain is totally convinced she has sound reasoning. When you see someone you are close to struggling with money, the common advice given to the close person is to manage his or her personal finance better. And often, that is to do some form of money budgeting. What we hope is that by going through the budgeting exercise, the friend or relative can create a sustainable profound change in how they manage their money, and improve their lives. Yet a lot of time, budgeting your money as a starting point, doesn’t help much. I been budgeting seriously since I started work in 2004, and have 12 years of experience consistently doing up my budget, and my conclusion is that budgeting our money helps, but only for certain individuals that were enlightened at the start. Money budgeting works for folks that are not broken. For the rest, you either leave them to crash and burn, or send them to a NLP Practitioner, or a Church Pastor to shift their thinking. Today, let me deconstruct why NLP Gurus are needed to solve the real money problems. I been in this space for some time, and played with enough schemes of money budgeting. If I were to reflect on what has help me stayed on this path and not fall off from it, I wouldn’t place a high emphasis that doing budgeting got me to where I am. Tracking my money allows me to be aware of how much is my annual survival expenses, which enables me to compute whether I am financially secure at this stage of my life. Other than that, the formula to building wealth is to increase the gap between positive cash flow and the outgoing cash flow. The bigger the faster you get there. What helped a lot is that knowledge and wisdom gain from mentors in books, videos, real human mentors enables me to focus time and attention on things that have a bigger impact on my wealth at this stage, and try to do less of things that matters less. My beliefs and values are more focus, and more refined. By not being distracted by stuff that have lower priority, my spending automatically decreases. I don’t visit areas, or think about things that were in the past “necessary” but nowadays seems nonsensical. More of my time and attention are spent with loved ones, people that wants to create business and change, as well as where my net worth will be greatly impacted. As I reflect, the biggest lament I have is that, to build wealth, perhaps its less to do with the money but more on what happens in our minds. Why do I see curating thoughts and belief to be that important? I was always fascinated with why we do things in a certain way and that includes, why do we buy some things, spend on some services, yet we won’t put our money away to build wealth. In #1 key ingredient to building wealth, I share that to build wealth, you may need to find some motivation, be more determined and develop grit. Where we are most susceptible to create change to build wealth determine on different levels of influence we may experience. And this differs from person to person. The influence to how we spend our money can be illustrated in the flow chart above. For some people, the way they spend their money is heavily influence by their devotion, loyalty and responsibility to a higher state or spiritual in nature. An example would be how your religion influence the way you spend money, save money or view money. It can very well be determine by how the government, through propaganda influence the society’s view of money. The strength of this influence can be strong or weak. And it influence the next level which is your identity. This higher state may have a strong or a weak hold on how you live your life, not just regarding money. How you lead your life influences your world, what you believe in, and what things, services, ideas that you value more and value less. Your beliefs and values determine what you will do or carry out in life. This translates to actions, or the systems, processes that you come up with to carry out things in every day life. And most of the time, to fulfill things, you need money, and that is how you spend your money. What happens when we focus on budgeting money to create change? There are many forms of budgeting your finances, and I define budgeting your finances as forward planning how you will spend the available money at your disposal going forward. A simple budget can be something like the above. You compartmentalize your monthly salary into fixed containers and only put in a predefined amount monthly. If you spend and deplete one container, you cannot spend anymore. Money budgeting takes place by a person managing his or her actions dealing with money. We are trying to change the actions, create a system, working with money. The hope is that by changing the actions, he or she changes the beliefs and value, which in turn changes his or her identity. Thus it becomes more sustainable. The flaw of using actions to deal with money daily and not curating the belief and values is that the person doesn’t change their mindset how they view their relationship with stuff and wants. If we talk about whether they are following the rules of budgeting, I would say yes they are. They are mechanically not exceeding what they have and shifting money from one category to another. If you look at it philosophically, is shifting money that is spend from one value to another the right move? They might not be. What if we tackle budgeting at the right place? Now instead of budgeting your actions with your money, let us try budgeting somewhere higher. 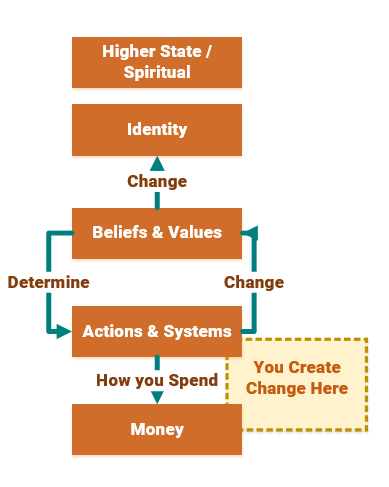 With this shift in beliefs and values, we can then provide guidance the appropriate actions and systems to create. 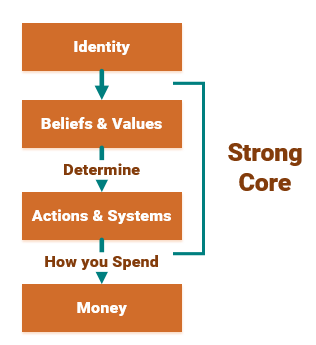 How do we budget our beliefs and values? 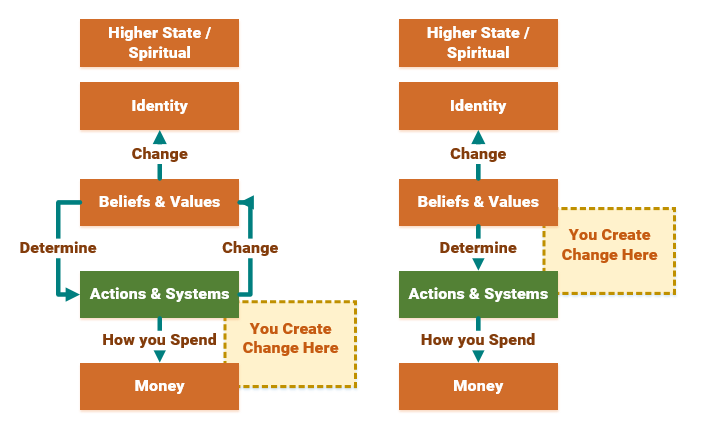 I find that to best align to our beliefs and value is to budget our actions, through time and attention. If we agree that most of what we do should be placed in the areas where we most value, then being very vigilant in curating where we spend our time and what we think about is important. Let us take an example of a 29 year old who is focus on creating a business, on top of performing at his main job, in a IT consulting firm. The illustration above shows how the entrepreneur uses his 24 hours. There are less time for sleep, for fun and family. It is his belief that at this stage of his life, these things are of less importance. He could always get back to them. His time is spent building up capital through his job and the time that he have out of his job, he will work on his side business and build up knowledge, both for his main job and side business. If we look at the same person’s attention, his mind throughout the day, the mind is probably being occupied by his job and what he could do on his side business. There are very little room for thinking about where to have fun, or even the thought of vacation and food. His actions and systems that result will be rather focus on what he believe in and where he values. This is provided he has this level of discipline to be so stringent. Top performers are able to do this, and they are top performers because they are able to focus their attention and curate their time to be tune close to their values. If this entrepreneur does have a budget, do you think he will have money set aside for vacation or a lot for rich meals? When your time and attention are spent in a certain way, it is likely how you gear your money will be in the same way. Perhaps it is very lopsided, and missing some important long term savings, such as emergency funds and retirement funds, but you can see what will happen if budgeting is carried out on a higher level, by budgeting the time and attention. Many of you who have a good handle on money matters, struggle to understand why listing transactions down, doing monthly allocation can be a hard thing. When you value the way you deal with money high in your value system, or that you have a good philosophical view about money, you see managing money as a necessity rather than something good to have. It is easy for you to create the necessary actions and systems to eventually deal with things. it is easy. When you are able to curate your values well, you may not need to meticulously bother about the bean counting form of budgeting. In fact, we don’t budget at all! Instead, we operate from the perspective that we’re not going to spend any money. Obviously we do spend money, but not a whole lot of it. When you start from the idea that you can spend up to a certain budget cap, I think you’re almost guaranteed to spend that much. Conversely, if you start from the framework of spending $0, you’re less inclined to incur debits against your long-term goals. Spending is like a gas–I guarantee you it’ll expand to fill whatever space you give it. So rein in that gas! In this same vein, our frugality is successful because we created frugal habits, which we routinely execute on frugal autopilot. We don’t innovate frugality every single day, we just follow the effective frugal lifestyle we’ve devised. Money budgeting at the onset is more to create the actionable lifestyle habits. 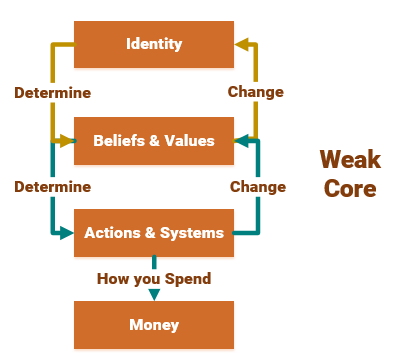 When your actions and systems feed back to your beliefs and values, your beliefs and value will drive you to manage your money better. If you can curate your time and attention well based on your beliefs and values, then you can use a very simplify budget. Many bloggers do this, are comfortable with it and for these people who have mastered it is financially sound. That is not to say we are all super human beings who can curate our time and attention like robots. We couldn’t, which is why we do struggle at times. And for most people, it is a constant struggle as your friends tries to help you by trying to tune your beliefs and sometimes you buy in, sometimes you do not. You change your actions and what you do, in the hopes to have a better money outcome. Yet at times, because you failed to curate those beliefs your friend understands, but you have yet to fully understand, you realize your budget does not make sense, or that you steal from some budget categories and allocate them to others. The most likely result is that money budgeting is just a futile exercise of bean counting without creating a meaningful change. For all of us to move to a higher level in our money philosophy, beliefs and values, we need to increase our competency, be more knowledgeable, and have time to reflect to gain wisdom. All of these are in short supply in a world that makes us impatient, which tries to distract us. 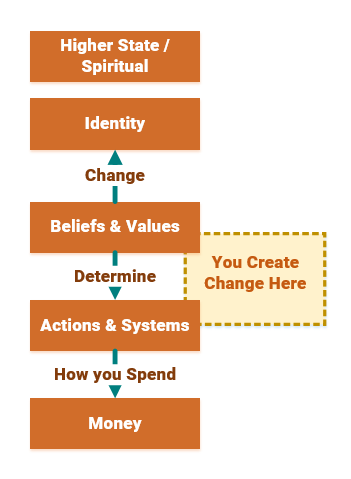 Changing someone is difficult if they are not motivated enough (which is 1 of the 4 ingredients to wealth along with knowledge, actions & systems and environment). My advice is that if you are not that altruistic, or the person is not that close, giving more and being invested will just give you more frustrations. You will not be satisfied that you have help in creating something good. If we shift the values and the beliefs, empower them with an alternate reality that is reachable, they put in the actions and if they see the results, things may happen. What you realize is that whether you decide to carry out money budgeting or, as proposed by me, curating your time and attention, the important thing is that it involves some form of actions and creating some processes and systems that suit your personal situation. It has shown that if we always rely on motivation to determine our success, we could potentially fall off the bandwagon because motivation fluctuates. By doing things, practicing curation of time through sticking with our calendars, focusing on spending our time and attention on things that matters, or adjusting our budgets, entering transactions, we stand a better change to create change. A lot of the money problems we faced are the manifestation of the mind. If its not your mind is another person’s mind. Budgeting your money sounds like good advice to get someone to do something, but when you really need to get to the root of the problem, this solution often do not go far. If you want to help your loved one, I hope that you can convince him or her to change their beliefs. Else I hope the person comes to their senses themselves because some of their mind is so far gone, that it is best you avoid the problem all together than to deal with it. i am someone like u mention in the article . a person who has no need to budget yet can save >50% consistently every month due to frugality habits in built. hi dan, I am happy this article is of some help. What are some of the biggest challenges for your peers when it comes to money?